Since over 50 years, the city of Saint-Tite will adopt a typical Far West style and come to life for the Festival Western St-Tite. 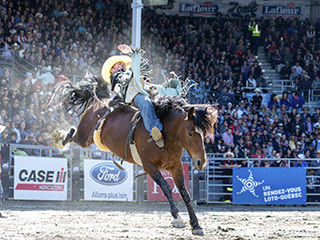 This festival has a unique, exciting atmosphere thanks to 10 professional-level rodeos. Different music and dance presentations will provide hours of guaranteed pleasure. It is the largest gathering for country dancing in Quebec, Canada. Also, the first Sunday of the event, you will get a chance to participate in Canada's largest parade completely dedicated to animal-pulled floats. This is a premier family event in the streets of Saint-Tite. Don't miss this international event, recognized as the largest western attraction in Eastern Canada, and the perfect occasion to live like cowboys.